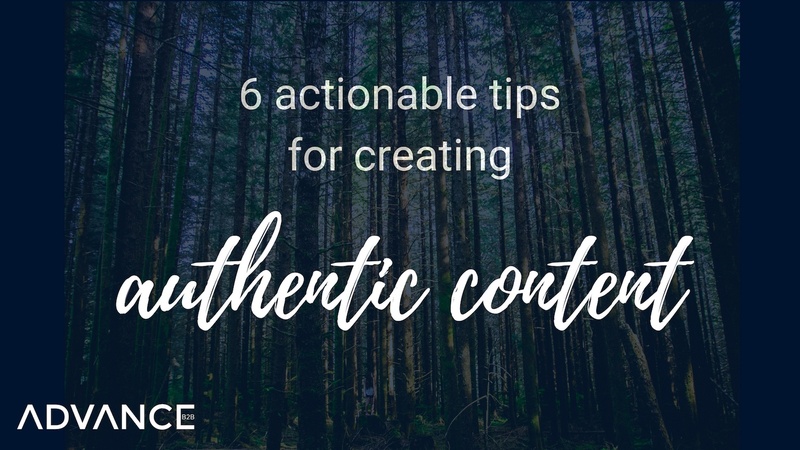 As I get started at Advance B2B as a Content Marketing Specialist—and with my new life here in Finland—I thought it would be fitting to talk about authenticity and content marketing. Why? Finns are known for their honesty and directness—something I appreciate having recently moved here from Montreal, Canada, where there’s more emphasis on being polite. Plus, I’m intrigued by the rhetoric of authenticity in marketing and the contradictions that come up. Like the messaging of beauty companies, for example, that urge women to wear foundation to return to their “authentic” selves. Authenticity has been overemphasized in the marketing industry to the point that it’s almost become an empty buzzword. So how do we talk about brand authenticity? Isn’t marketing by nature inauthentic? Let’s dig into this tricky term and consider what it means to create authentic content in today’s marketing landscape (I promise I won’t say “Just be yourself!”). Even when authenticity isn’t in discussion, this idea is at the core of content marketing. Talk less about yourself, and more about your customers. What do they care about? What are their challenges? What motivates them? If you constantly bring up your company’s products or services in your content, your audience will tune out. You’ll kill your chances at earning their trust. Great content marketing requires genuine empathy for your audience. You want to provide them with real value—not just convince them to buy from you. And that means you need to know what your audience finds valuable. Aim to answer your customers’ questions, as Marcus Sheridan urges in his book They Ask, You Answer. Also, deciding not to take on a customer because your offering isn’t aligned with their needs is better than pretending you’re the right fit for them. It’ll show you have their best interests at heart. Plus, you never know when they might recommend you to the right type of buyer. People trust people—not brands. When you write blogs from an individual perspective and share them through your personal account, people will better relate to your content. Step away from overly staged and cheesy stock images and instead share original photos of your team members and office on your site. Drift is a perfect example of a company that showcases its people as a way to humanize its brand. To compete in a crowded market and build brand awareness, Drift aims to be authentic. And it does so by showing the real lives of its employees and customers. When we know more about the people behind a company, we develop an emotional attachment to them and feel more connected. It’s great to embrace humour and keep a light tone throughout your content. But once you’ve decided on your voice and tone, keep it consistent across all your online channels. You also want to align your online personality with your in-person experiences. Every touchpoint you have with your customers—whether by phone, email, or face-to-face— is an opportunity to connect and reinforce your brand. Aim to bridge the gap between your online and offline personalities to earn your audience’s trust. Good marketing is all about creating conversations with customers. Your audience is made up of real people, and real people crave personal connections. Sparking conversations with your audience—by asking questions at the end of your blog posts and on social media, for example—is how you’ll build connections. Sharing user generated content is another key way to involve your audience and show the human side of your brand. Inauthentic content marketing would involve saying untrue things or falsely portraying your company to get a specific outcome. However, if you truly stand by your company mission and believe that the content you’re sharing is meaningful, your audience will sense that. Giving your audience a behind-the-scenes look at your company is a great way to show them who you really are. Whether in a blog, social post, video, or webinar, share your work culture and how things actually go down at your company. People appreciate transparency. Embrace the unpolished, messy, and chaotic (read: human) side of things. Connection requires personality—don’t be afraid to take risks, and just be yourself (sorry, I broke my promise). Leave a comment if have any thoughts on this topic, and feel free to reach out if you need help marketing your brand in a more authentic way!